… It had been a good night. The wine was sweet and the barmaids obliging. Nick staggered slightly as he stepped into the street. A full moon hung low above the rooftops. The cool air was welcomely refreshing. Nick waved away the servant who stood waiting and set off alone through the quiet streets. His way passed through a poorer part of town. He stumbled on the rough ground and bumped against a wall. As he steadied himself, he heard a girl’s voice from the window high above. “That’s all I really want….” Without thinking, Nick paused to listen. What women really want: that would be good for a young man to know! “And he would never want me after that…” The first voice dissolved in tears. Nick bowed his head in confusion. Three gold coins: he had three times that in his purse at the end of a night out. To these sisters, it was the difference between life and despair. He pulled the little bag of money from his belt. Should he call up to them, throw it through the window? But they might be scared, ashamed at having been overheard. Better to leave it secretly, where they would find it in the morning. He only had one purse: how to show their father that this was for his girls to share? Nick stood on one foot: wobbling, he pulled off one silk slipper, then the other. 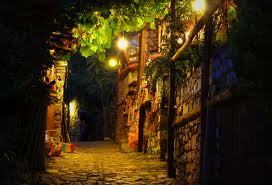 Swiftly he filled them with coins, twisted each into a ball, tossed the three little sacks over the courtyard wall. 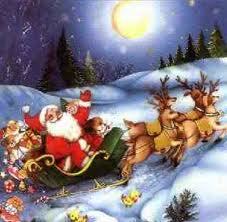 He heard them land with soft jingling sounds. Then he ran down the street, his bare feet thudding on the ground, laughing like a schoolboy. From that night onwards, Nick was a changed man. He still liked the good life: he could drink and sing with the best of them. But he seemed gentler, more interested in other people. When he heard a story of hardship, there was often another tale next night of unexpected generosity, an unseen benefactor who had helped in hidden ways. No-one knew who gave these gifts: they were left in secret, without the expectation of thanks. 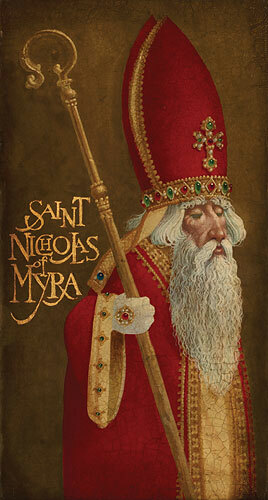 Nicholas joined the Christian Church and rose to become Bishop of Myra, in south-west Turkey. He was eventually canonized, although his full title sounds a little formal: the children whom he loved shorten Santa Nikolaus to Santa Claus. The three bags of gold are echoed in the three gold balls found outside a pawnbroker’s shop, giving people another chance in life.To this day, millions of people around the world help Nicholas in his work. At Christmas time they give gifts to children just to make them smile. Forget about magical flying reindeer: now that’s what I call a real miracle. Read about Christmas Customs and why we send Christmas Cards! This entry was posted in History, Religion and tagged Father Christmas, Good St Nick, history, Is Santa Claus real?, real, religion, Saint Nicholas, Saint Nicholas Day, Santa Claus, St Nicholas, St Nicholas Day, true. Bookmark the permalink.